You’ve got to admire leeks. They’re exceptionally hardy, generally trouble-free, and best of all they will provide beautiful long stems from autumn right the way through to spring at a time when other harvests are thin on the ground. Now’s the time to start thinking about sowing them…so let’s get started! Leeks are very hardy vegetables, which in most regions will safely sit through frost and snow to be lifted as needed. You can prolong the harvest period by selecting a mix of varieties. Early season leeks are less hardy but will be ready for autumn, while mid and late season leeks will give you smooth stems for winter and spring. Grow leeks in a sunny, open position in well-dug soil that’s had plenty of organic matter added to it. The fungal disease rust can be a minor problem from summer onwards, so look out for varieties described as ‘rust resistant’ and make sure you leave enough space between plants for good air movement. The earliest varieties can be sown under cover from late winter, with others following on from mid spring. Leeks are usually sown in pots or trays of compost and then transplanted into their final position when they’re big enough. For guidance on when to start sowing why not try our Garden Planner, which uses data from your nearest weather station to recommend the best times to sow, plant and harvest your crops. Sowing is very easy. Start by sieving potting compost into pots or trays. Gently tamp the potting compost down then sow the seeds very thinly so they fall about an inch (2-3cm) apart. You can also sow two seeds per cell in a module tray. Now cover them over with a thin layer of more potting compost, and water them. Keep the potting compost moist as the seeds germinate and the seedlings grow on. Early sowings should be placed on a sunny indoor windowsill or into a greenhouse where the warmth will encourage quicker growth. As the seedlings grow you can if you wish separate them out and pot them on into individual pots. 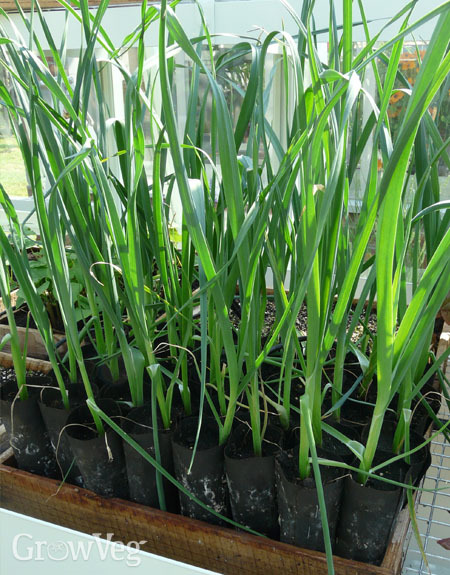 Before transplanting your young leeks make sure you’ve acclimatised them to outdoor conditions by leaving them outside for increasingly longer periods over the course of one to two weeks. They’re ready to transplant when they are six to eight inches (15-20cm) tall. Begin by ‘dibbing’ (poking) holes that are about the same height as the leek seedlings' stems into well-dug soil. You can use a purpose-made dibber for this, or improvise with a cut-down handle from an old broken spade or fork, or even use the handle-end of a hand tool such as a trowel. Make one hole for each plant. The holes should be about six inches (15cm) apart, with a foot (30cm) left between rows, or if you’re planting in blocks space then seven inches (20cm) apart each way. Now carefully remove the leeks from their pots and, if they haven’t already been potted on, tease the roots apart. Place the seedlings into the holes. It’s important that the roots reach right down to the bottom of the hole, so if necessary, help them along – you may need to trim them to get them in if they’re very long. With your leeks in position, fill the holes to the brim with water and leave to drain. Do not fill in the holes. The soil will naturally fall back in with time, allowing the shanks (stems) to swell easily. If you want to maximise space you can grow fast-growing salad leaves in between your newly planted leeks while you wait for them to establish. Salad crops are shallow-rooted so they won't compete with the deeply-planted leeks. By midsummer the leeks will need all available space to encourage high light levels and good air circulation. Easy-care leeks need very little attention. Water the plants in very dry weather and keep the ground between the leeks weed-free by hand weeding or hoeing weekly. If you want really long, white stems, you can ‘blanch’ your leeks two to three weeks before you want to harvest them. Simply draw the soil up around the shanks to exclude light, or tie cardboard tubes around the stems. Leeks can be harvested as soon as they’ve reached the desired size. Slip a fork underneath the plant to lever it out, while pulling up on the leaves. Trim the roots and any damaged leaves onto the compost heap then wash away the soil ready for the kitchen. Hardy varieties may be dug up as needed over the winter, though in very cold areas you may want to dig them up before the ground freezes solid. Leeks are very versatile vegetables, and can be added to all manner of recipes, including stir-fries, quiches, soups, pies and tarts. For a luxury side dish try adding cream and grated cheese to sautéed leeks before serving piping hot with a grind of the pepper and salt mills. Mmm! Look after your leeks and they’ll love you back! If you’re already in the know about leeks and fancy sharing some cultivation or culinary tips, do drop us a comment below. Happy sowing! "When I grow leeks they always develop a main stem and go to seed/flower. What causes this?" "Leeks usually go to seed (or bolt) in response to a spell of cold weather. To avoid this, make sure you sow them at the right time so they aren't exposed to really cold weather early on in their life. Leeks grown to harvest over winter will usually go to flower as soon as the weather warms up in spring. Sometimes excess fertiliser can lead to bolting, so only nourish your leek beds with organic matter, applied the season before planting. Also, transplanting the leeks while they are still quite thin and small will reduce the risk of bolting." "do you cut off the scapes ? or do you leave them?" "do you cut off the scales? it's july and i planted starts in april. the plants are healthy and about 3-4' high. our weather is hot for a few days then cool for a few days. in a double row i have just 4 plants that have flowering stems/scapes. with my garlic i cut them off, should i do the same with leek scapes. the leek scape is quite thick, thumb thickness." "Hi Lee. Yes, cut off the leek scapes/flowers to concentrate the plants' energy into the stem." "I sowed leek seeds 2 years ago, then planted them out in May. Things happened and the garden was neglected. I'm back now and find young leeks in the exact drills that I planted them in 2 years ago. Will they grow as a normal crop? Or will they run to seed? " "If they are young leeks then it suggests the original leeks produced flowers and set seed, which then fell to the ground to produce the seedlings you see. So there's every chance they will in fact grow into useable leeks - an unexpected bonus!"